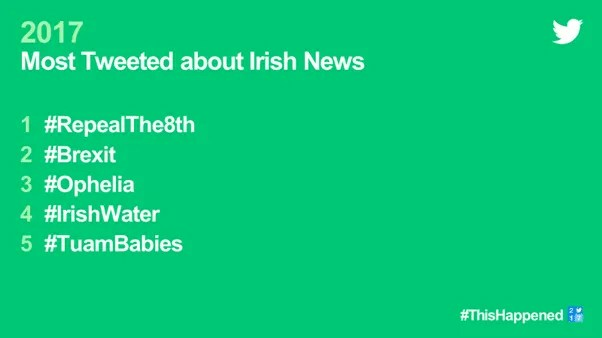 From #Ophelia to #COYBIG, Here Are The Top Irish Twitter Trends of 2017. As we reach the end of 2017 Twitter is reflecting on the year that was: from breaking news, entertainment, sports, and local conversations, if it happened anywhere, it happened on Twitter. 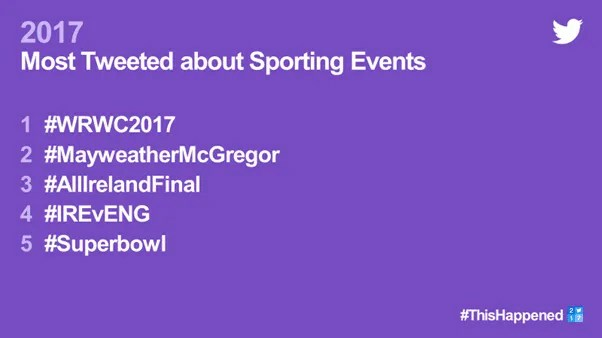 This year saw Irish Twitter users react en masse as Hurricane #Ophelia swept through the country, engage in the ongoing political and constitutional debates on #Brexit and #RepealThe8th, and celebrate and speculate on global sporting occasions like #WRWC2017. #COYBIG once again ranked high in commentary as Martin and Roy’s boys got within one match of a trip to Russia. 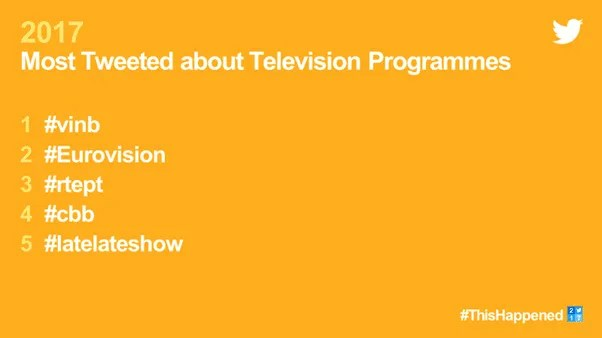 Meanwhile, TV viewers said goodbye to larger than life character #vinb and his Twitter ‘machine’, with true Irish Twitter wit taking centre stage at every occasion. 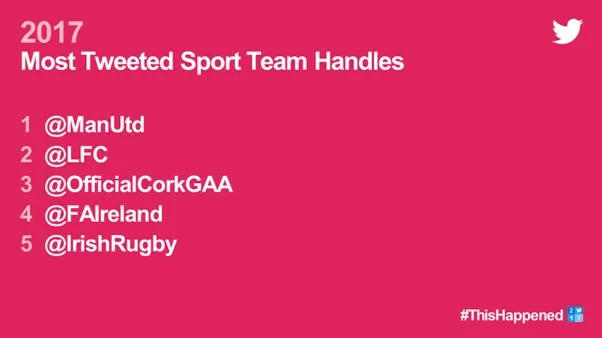 Tweets connected people across the world and in Ireland during key moments in news, politics, entertainment, music and sport. 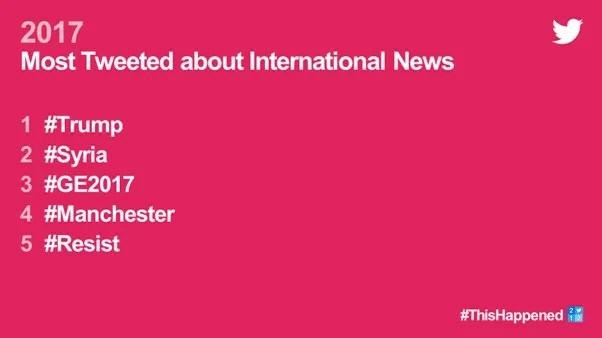 They shared joy, humour, news, ideas and opinions about the biggest conversations happening in the world throughout 2017. Whether it’s with 140 or 280 characters, the classic Irish wit and humour can be witnessed at its best on Twitter every day as key events happen. When the true meaning of sport was shared. When a chance motorway meeting captured the nation’s humour around hurricane warnings. When Irish sports fans celebrated a memorable win against England. Twitter is one of the best ways to connect with like-minded fans, top musicians, celebrities, politicians and sporting heroes around the world. 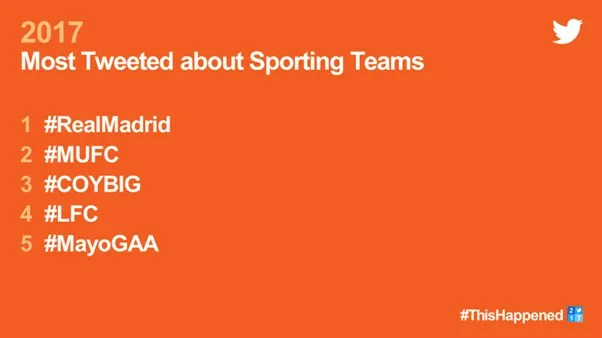 Looking at sport, @ManUtd is the most mentioned sports team by Irish Twitter users, followed by @LFC and @OfficialCorkGAA. 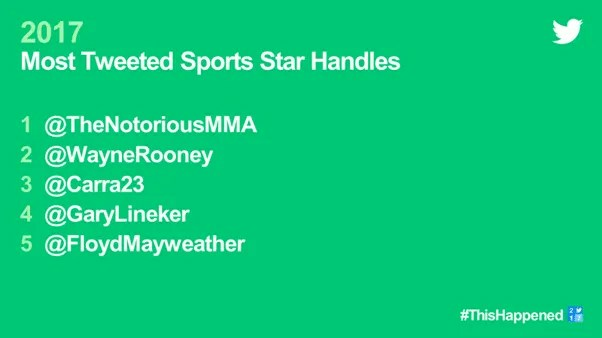 Unsurprisingly, Conor McGregor, @TheNotoriousMMA, was the sports star most mentioned by Irish Twitter users in 2017. 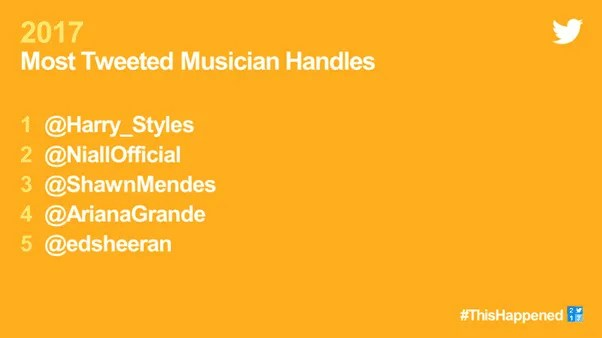 2017 was also the year for record breaking Tweets. Carter Wilkerson’s attempt to win a lifetime supply of chicken nuggets from American restaurant chain Wendy’s was Retweeted an astonishing 3.6 million times in 2017. This made it the most Retweeted Tweet of all time, beating Ellen De Generes’ selfie at the 2014 Oscars into second place. Finally, in August, Barack Obama’s heartfelt call for tolerance and equality was the most liked Tweet of 2017, and is now the most liked Tweet of all time, attracting over 4.5 million likes.